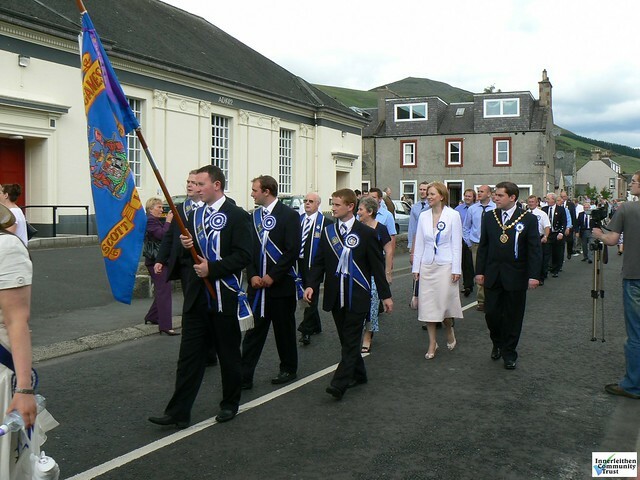 With the exception of the war years (Crimean, World War I and World War II) St. Ronan’s Border Games have been held annually in Innerleithen since their inception in 1827. Until 1900, on the Friday evening the townsfolk would enjoy “The Nicht Afore the Morn”, which consisted of a concert followed by a dance in the town hall. On Saturday afternoon the town brass band and local dignitaries would lead a parade of townsfolk to the park where the Games were held. At that time competitors vied for victory in track and field events similar to those in modern athletics meetings. Sports and fun events for children were also included. There was usually a funfair nearby and more dancing took place in the evening. From 1901, the Cleikum Ceremonies became the main spectacle on the Friday evening and over the years the two-day festival has been extended to include a Kirkin’, a fancy dress parade, a separate children’s sports and treat, a ball, and so on. Today “Games Week” stretches over ten days.